Gymnast and Olympic gold medalist Shawn Johnson is the epitome of wholesome. Is she the victim of a clueless production team who made this commercial or a sly copywriter? Or do I have a sick mind? You be the judge. Thanks to Lynn for sending me this video (I think). Reference for the title of this post. Still funny after all these years, and mmmm, Katz Deli… Warning: contains not safe for work content. To finish out my posts about my foray into Utah’s food scene, here are six food finds you should check out if you ever find yourself in the Beehive State. 1. 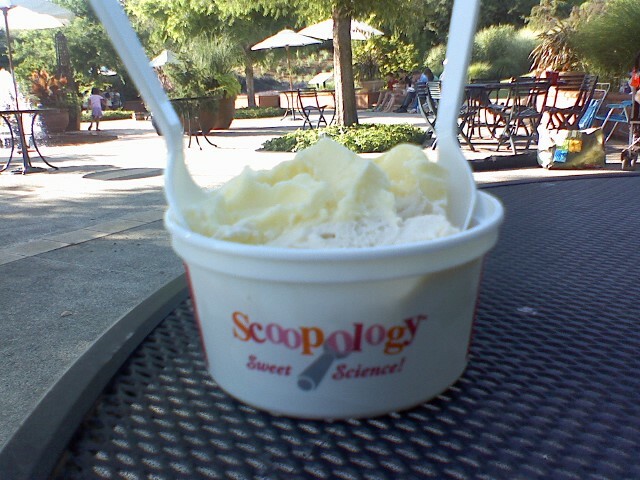 Roasted banana ice cream at the University of Utah’s Red Butte Garden served by Scoopology. 2. “Tennessee tangos” at Sugarhouse BBQ. The rest of our meal was kind of a disappointment, but the rib tips were divine. 3. Grilled ham and cheese sandwich with fries at Liberty Park. A homey treat like mom used to make. While you’re at the park, be sure and visit the Tracy Aviary. 4. Hawaiian shave ice at the Park City farmers market. I got mine with mango, lychee and ling hing mui flavoring. 5. Liberty Heights Fresh. I wish this was my grocery store. 6. Mazza. We wanted to eat at this Middle Eastern restaurant but ran out of time. Sarah and Damon were kind enough to share some leftovers they happened to have in the fridge, and they were delicious. I could only imagine how good a full meal would have been. The food highlight of our trip to Utah was a visit to Tony Caputo’s Market and Deli. With its artisan cheeses, in-house salami maker(!) and premium chocolates, Caputo’s feels like it should be in major metropolis like New York or Chicago. This is definitely a place I never expected to find in Salt Lake City. Despite having most city trappings, SLC still feels more like a small town to me. Plus–who knew there were Italians in Utah! That’s the fun of living in a nation of immigrants–people can wind up anywhere. Caputo’s is located downtown and as expected, does brisk business at lunch, which was when we visited. My husband, our friend Damon and I followed the crush of people to the deli counter–a lean, mean, well-oiled machine. But service was anything but brusque. It was warm and welcoming AND quick. I had the muffaleta sandwich with salami, ham, mortadella, cheese and olive salad on a French roll that was some of the most perfect bread I’ve ever had. It was firm enough to hold everything together but it was soft enough so it didn’t tear up the roof of my mouth or disintegrate into a thousand crumbs every time I took a bite. Most of the people eating in the deli were chowing down on meatball subs. They looked so happy that I also ordered a side of meatballs. I soon understood their bliss. The meatballs were tender and succulent, and the accompanying marinara sauce had a rich tomato flavor without being too acidic or cloyingly sweet. The only bad thing about the meatballs was that they made me so full, I had no room for chocolate cake. Each slice at Caputo’s is 3/4 pound. My husband had the signature Caputo sandwich, which was named the third best sandwich in America by “men’s entertainment magazine” FHM. (I imagine the writer’s pitch to his editor went something like this: “Hot chicks eating sandwiches–it’ll be great!”) The Caputo is an Italian meat-lover’s dream with prosciutto, mortadella, salami combined with provolone, lettuce, and tomatoes on a hard Italian roll covered with olive oil and balsamic vinegar. Damon had the chicken parmesan sandwich, the special of the day and one of his all-time favorite foods. It wasn’t goopy as many chicken parms can be. The chicken was crisp and provided a solid base for the mozzarella and marina sauce. He washed down that goodness with an apple beer, an interesting non-alcoholic drink produced in SLC. Really good food commands your total attention. You want to concentrate and get lost in the food because you may never be able to replicate that experience again. Our table was completely silent until we all finished our sandwiches. The deli is just one of the many delights at Caputo’s. The market displays the largest selection of Italian and Southern European foods in Utah. It’s is the type of place you could visit every day and find something new and unexpected, be it a cheese cave, 60 different olive oils or high-end chocolate flavored with bacon. The next time I’m in Salt Lake City, you’ll know where to find me.